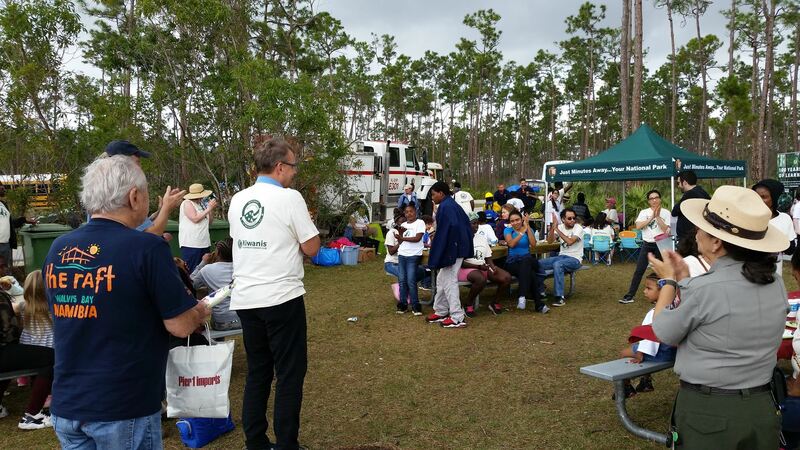 Thanks to the Park Rangers and Fire Rangers, the Biscayne Bay Kiwanis, our wonderful teams, 51 RPCVs & their families, and the organizing by Genevieve Bazer for our 20th Annual Outing to the Everglades National Park as well as the post event wrap up at the home of RPCV David Garcia in Homestead. And Lots of Official Resident Greeters ! The anhinga(/ænˈhɪŋɡə/; Anhinga anhinga), sometimes called snakebird, darter, American darter, or water turkey, is a water bird of the warmer parts of the Americas. 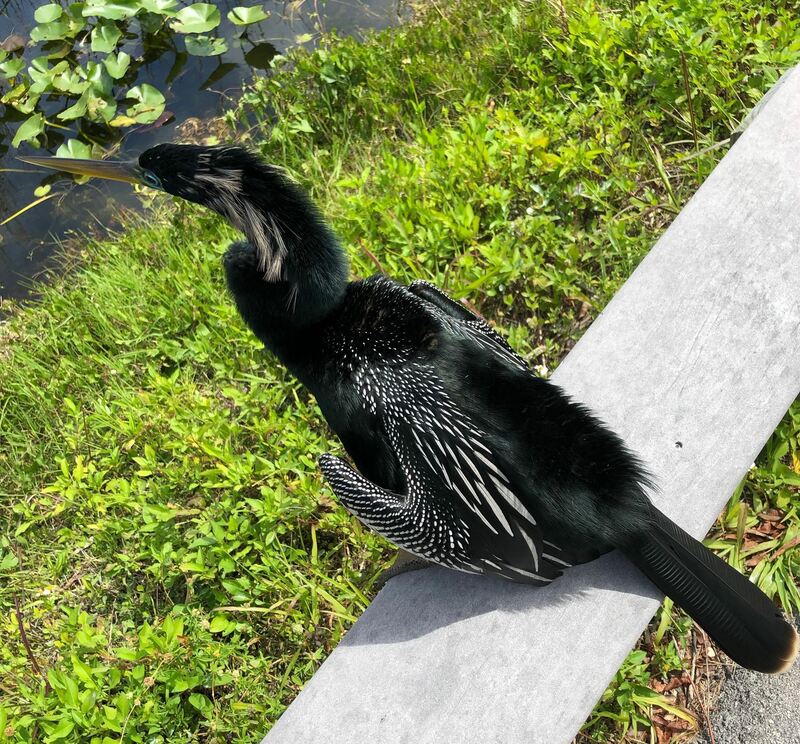 The word anhinga comes from the Brazilian Tupi language and means devil bird or snake bird. The origin of the name snakebird is apparent when swimming: only the colored neck appears above water so the bird looks like a snake ready to strike. They do not have external nares (nostrils) and breathe solely through their epiglottis. Like other darters, the anhinga hunts by spearing fish and other small prey using its sharp, slender beak. 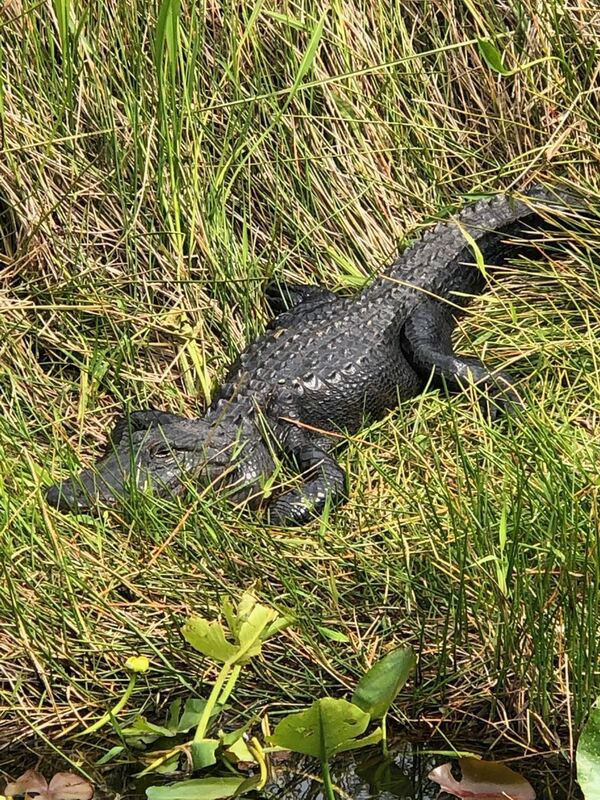 You can read about our 2018 outing to the Everglades at the end of this page. March 16th, 2019 -- TRAVEL is about to announce our newest package, 2 weeks in October in Thailand, a rare comprehensive tour of the entire country. Stay tuned. Your life is incomplete until you have had high tea at the Mandarin Oriental Hotel in beautiful downtown (well, maybe just downtown) Bangkok. 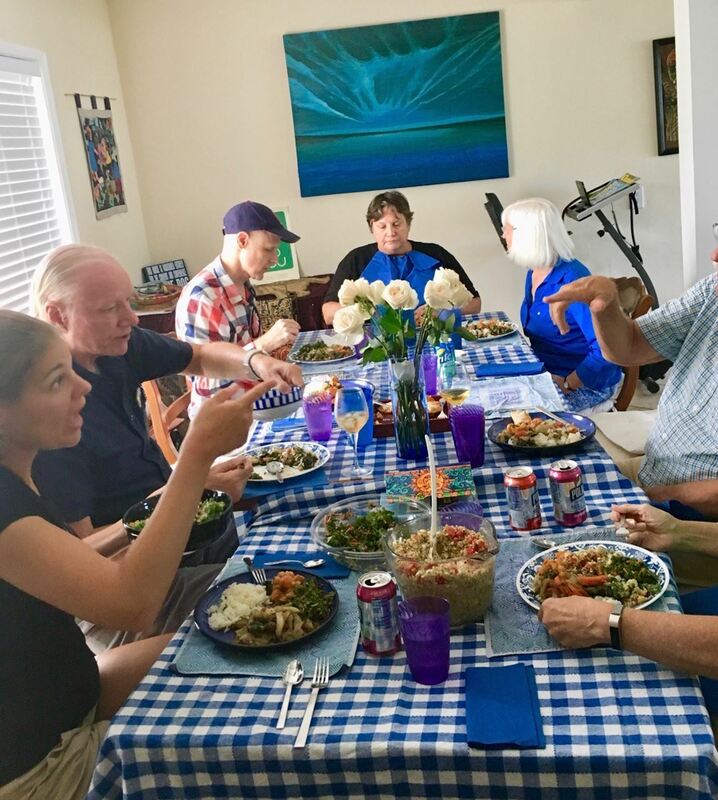 A project of Returned Peace Corps Volunteers of South Florida, Inc. This is not a fund raiser. The Trip Leader is not compensated. We start in Bangkok, one of the most crowded, vibrant capital cities in the world. We visit the major royal and religious sites, the floating market, and canal network. Then it is on to Kanchaniburi and the River Kwai. You will see the replacement bridge. (Original bridge go boom at end of film.) Also, a reconstruction of a Japanese POW camp and beautiful Commonwealth War Memorial Cemetery. Next we tour Ayutthaya, the ruined ancient capital of Siam. Then we go up into the mountains of Chiang Rai and Chiang Mai where we mix with the elephants. Finally we are off to the tropical beach resort of Phuket. Email request for a complete itinerary, included meals, sights, and hotel description. Cost: $2275 per person for 12 people double occupancy: LAND PACKAGE Note: The price increases with fewer travelers. Single traveler prices in the full itinerary. AIR PACKAGE FROM MIA: Approximately $1300. The travel agency will assist in booking or you may book yourself using miles or other promotional tools. Note: Travel Insurance is highly recommended. Information upon request. IF YOU ARE INTERESTED email travel@rpcvsf.org BEFORE APRIL 23, 2019. This is NOT a final commitment. If we have enough travelers to form a group, we will make our deposit payment together. Otherwise travelers can make arrangements directly with the travel agency. 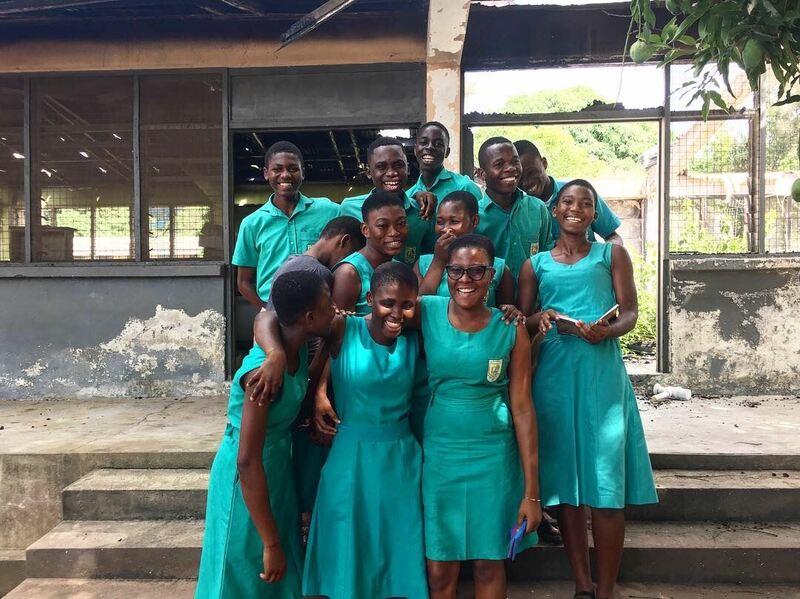 My name is Chelsea Currie and I am an Education volunteer with Peace Corps Ghana working as a physics teacher in a Senior High School in a rural town in the Volta Region. 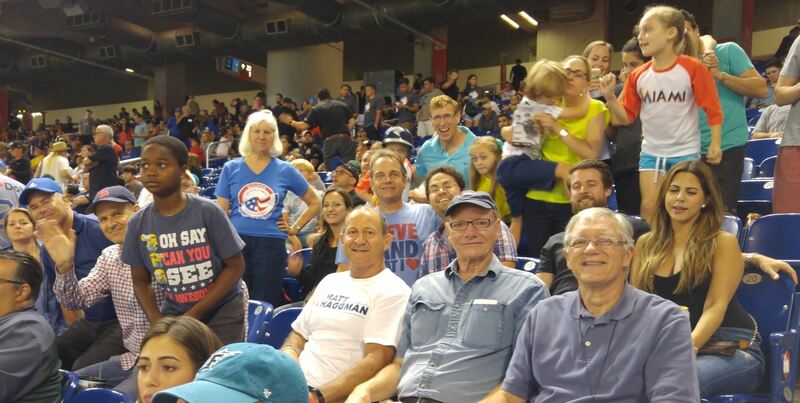 I am from Fort Lauderdale and graduated from the University of Miami and I was able to attend two RPCV events before I left for my service in May of 2017. 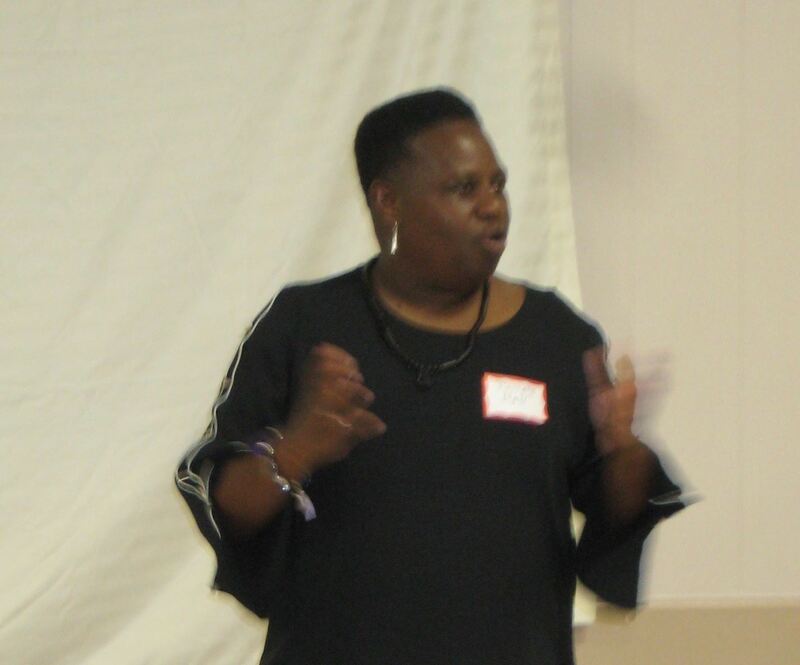 I am in my final term in school and our grant was just approved, so I am reaching out to the South Florida community for support in funding the project. 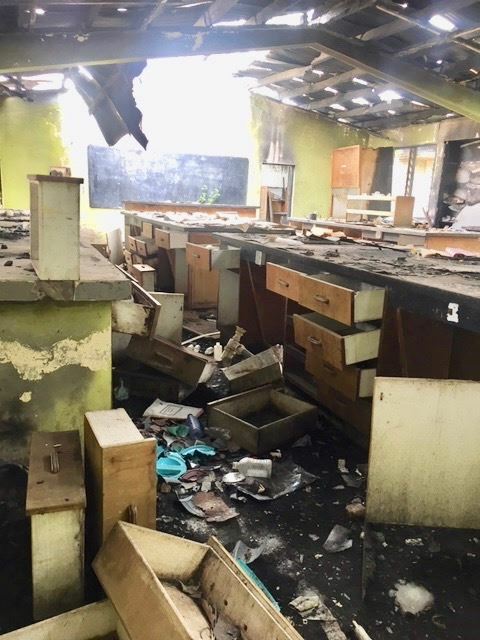 The top need and priority for the school is rebuilding of the science and computer lab which suffered a fire during Christmas of 2016. 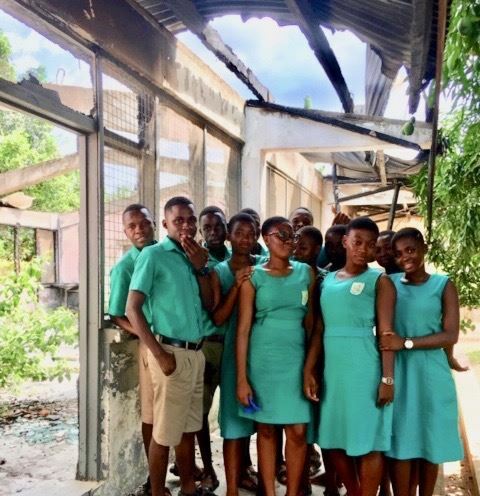 Since that time, the almost 500 students of the school have been lacking in their science and ICT practical aspects. A completed lab facility will allow the student to be prosperous in their courses, exams and future careers. I am asking if there is a way for this to be shared with the RPCV community so that anyone who feels compelled or is able to support the project can do so. Our goal is to begin building in May to please consider donating soon! Thank you in advance for your support! Finalists - Aileen Ochoa, Fundamentals of Speech Communication, Miami Dade College - Kendall Campus; Carlos Gonzalez, English Composition, Miami Dade College - Kendall Campus; and Susannah Brown, Art Education in Elementary & Secondary Schools, Florida Atlantic University. Winners - Dr. Ann Graziotti, Community Health Nursing Practicum & Advanced Concepts Practicum, Miami Dade College - Medical Campus; Dr. Joshua Schriftman, ENG/SOC Publishing, Justice & the Freedom of Speech, University of Miami; and Dr. Pamela Hall, Senior Seminar - Psychology Capstone Course, Barry University. One additional finalist, Liza Greenberg, College Prep Reading and Writing & English Composition, Miami Dade College - InterAmerican Campus, and one other winner, Dr. Jan Sokol-Katz, Juvenile Delinquency, University of Miami, were unable to attend. All recipients expressed gratitude to RPCVSF for the award and recognition they received. 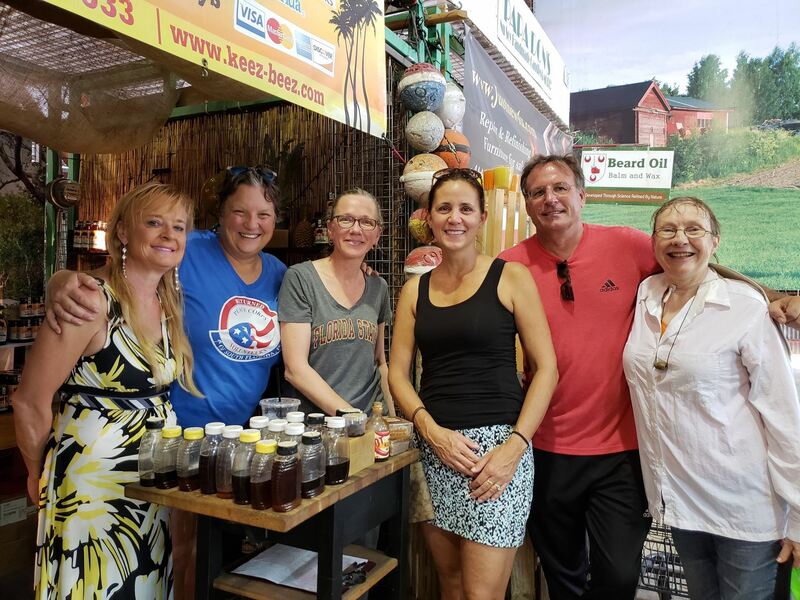 We had 6 attend the Yellow-Green Farmers Market on Sunday, September 30th, where we found RPCV Linda Alvarez selling honey from Florida Keys' bees. 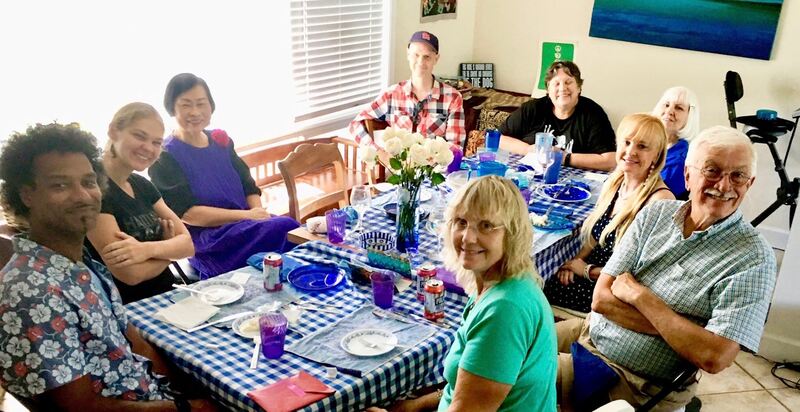 From left: Michelle Kelsey, Barb Junge, Linda Alvarez, Ann Gleeson, Seamus Gleeson, Lenore Sek. Not pictured: Sharon Alvarado. My name is John DeLeo Jr, and I am a PCV from Fort Lauderdale, FL, currently serving in the TEFL program in Kyrgyz Republic. 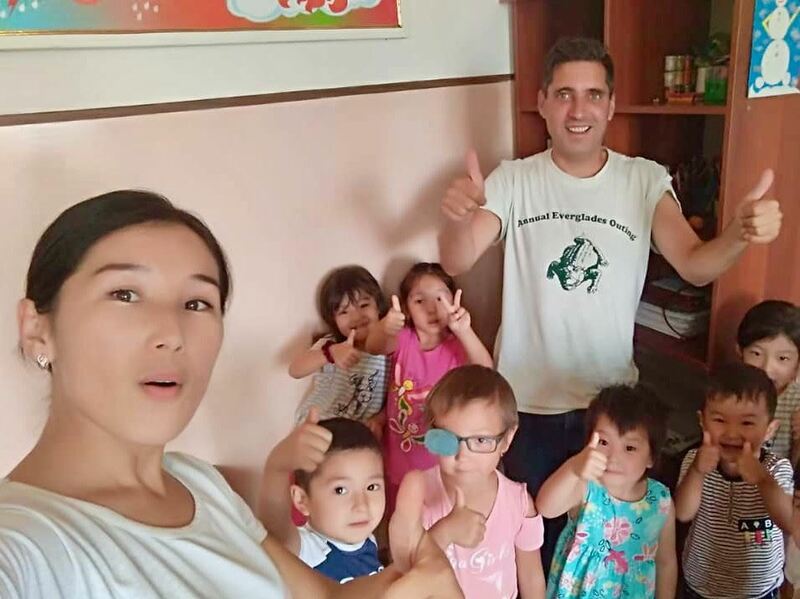 I have attached a picture of me wearing my 2017 Everglades Outing t-shirt while volunteering at a kindergarten in Osh City, Kyrgyzstan, during my school break. Thank you..
August 11, 2018 - Partnership Dinner in Miami at a famous Argentinian restaurant and grill. For details and to register, just click on Partnership Dinner in the Calendar at the top of this page. 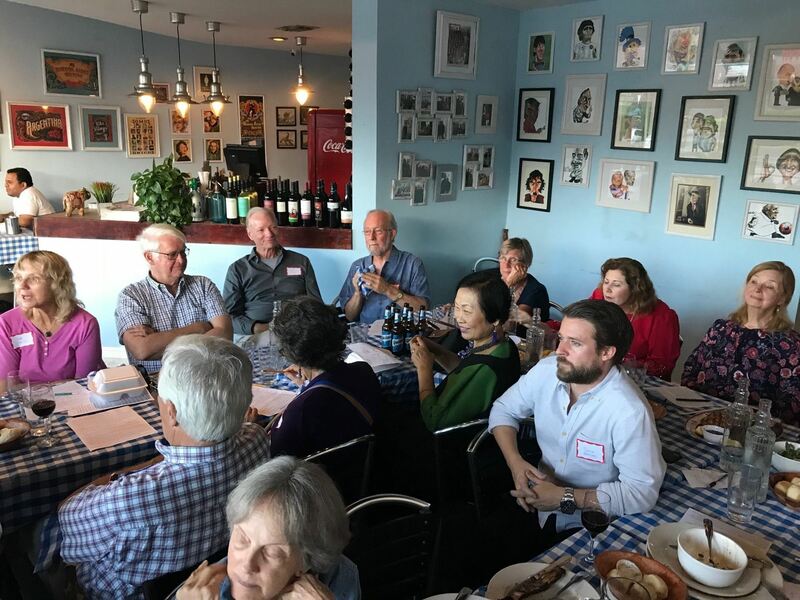 August 5th, 2018 - Partnership Dinner in Hollywood raised $210 which is 100% matched by RPCVSF for a $420 contribution to the Peace Corps Partnership Program. See the photos of this event in Our Photo Album in the Menu to the left. These two dinners supported a Girls Greenhouse Initiative in Armenia (led by a PCV from Florida); and a Resources for Girls' Empowerment and Equality in Moldova. 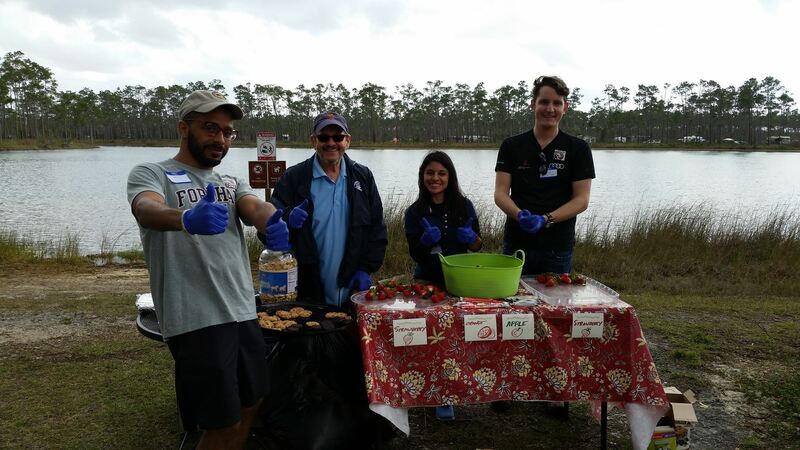 FYI - The Peace Corps Partnership Program (PCPP) connects Volunteers and their communities with the private sector in the U.S. and around the world in order to fund community initiated and led projects. PCPP is a proven mechanism for supporting small community-based grants. Over the past ten years, PCPP has funded over 7,200 Volunteer projects in nearly every sector, totaling more than 19.8 million dollars in grant funds. Last year alone, PCPP funded 930 projects in 57 countries, touching the lives of 1.5 million people across the globe. Over the same 10 year period, RPCVSF sent to PCPP over $16,800 that was contributed by diners and matched by RPCVSF. 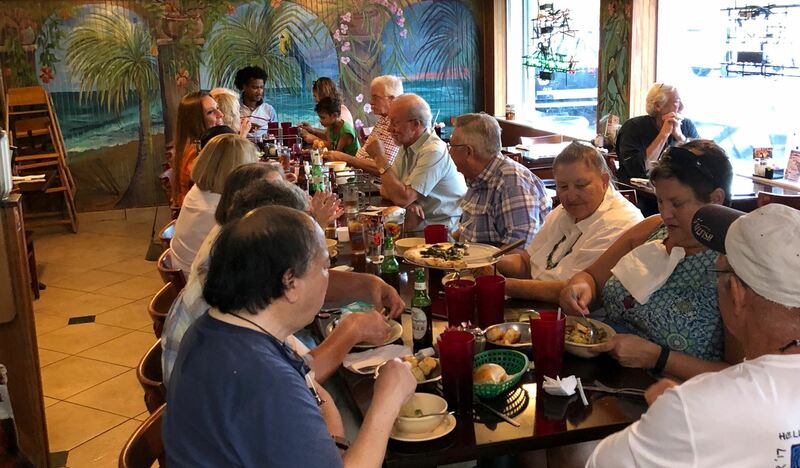 We have been doing Partnership Dinners for almost 35 years! Our thanks to all the diners for their contributions and all the wonderful restaurants who have made our contributions possible. 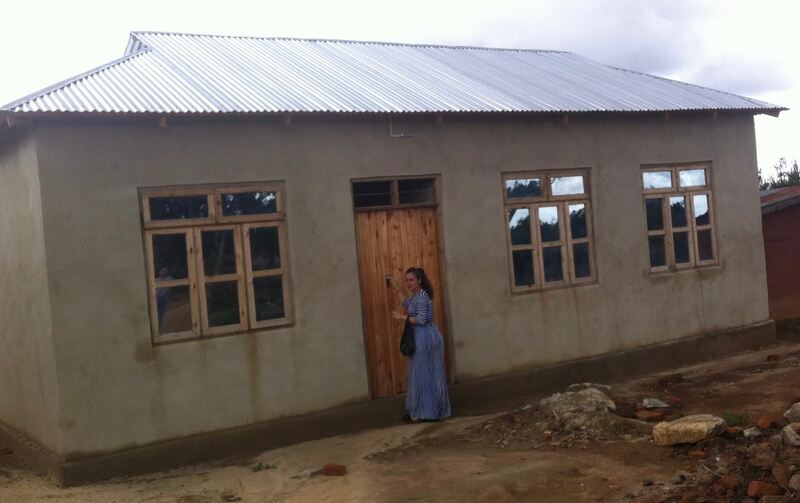 RPCVSF's Donation through the Peace Corps Partnership Program helped build this school! For More Photos of the Construction, Please see Our Photo Album to the left. We had a turnout of 19. Great game (2-1 Marlins in 10) plus post-game fireworks. 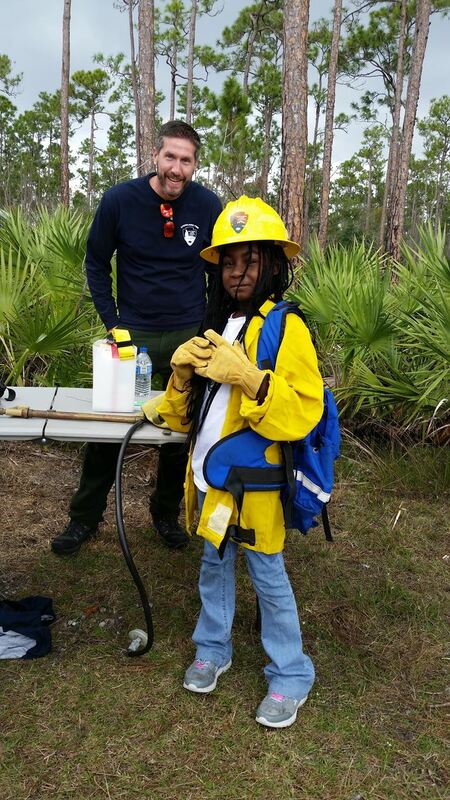 This year 29 RPCVSF members, 11 Kiwanis Club of Biscayne Bay members and six park rangers from the Everglades National Park hosted 78 wonderful kids and 37 accompanying adults from five homeless shelters for a day in the Florida Everglades. The total attendance including guests was 169. For more photos of the day, please click on "Our Photo Album" on the left side menu. Everglades National Park is a 1.5-million-acre wetlands preserve on the southern tip of the U.S. state of Florida. 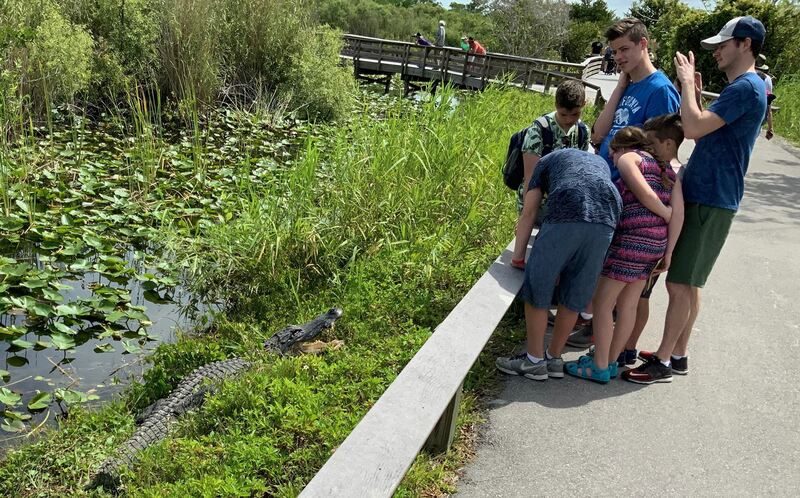 Often compared to a grassy, slow-moving river, the Everglades is made up of coastal mangroves, sawgrass marshes and pine flatwoods that are home to hundreds of animal species. Among the Everglades' abundant wildlife are the endangered leatherback turtle, Florida panther and West Indian manatee. The Everglades is the only place in the world where the American alligator and the American Crocodile coexist. RPCVSF Participates in the AmazonSmile Program. 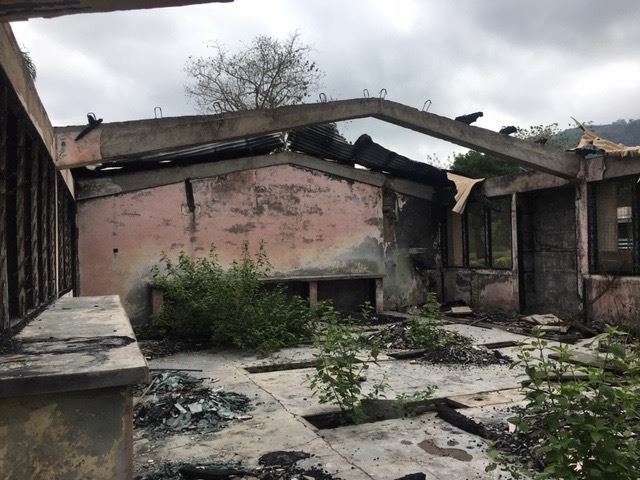 To sign up and participate at no cost, please select Returned Peace Corps Volunteers of South Florida, Inc. as your charity when you visit http://smile.amazon.com. Donations from AmazonSmile now exceed $625. 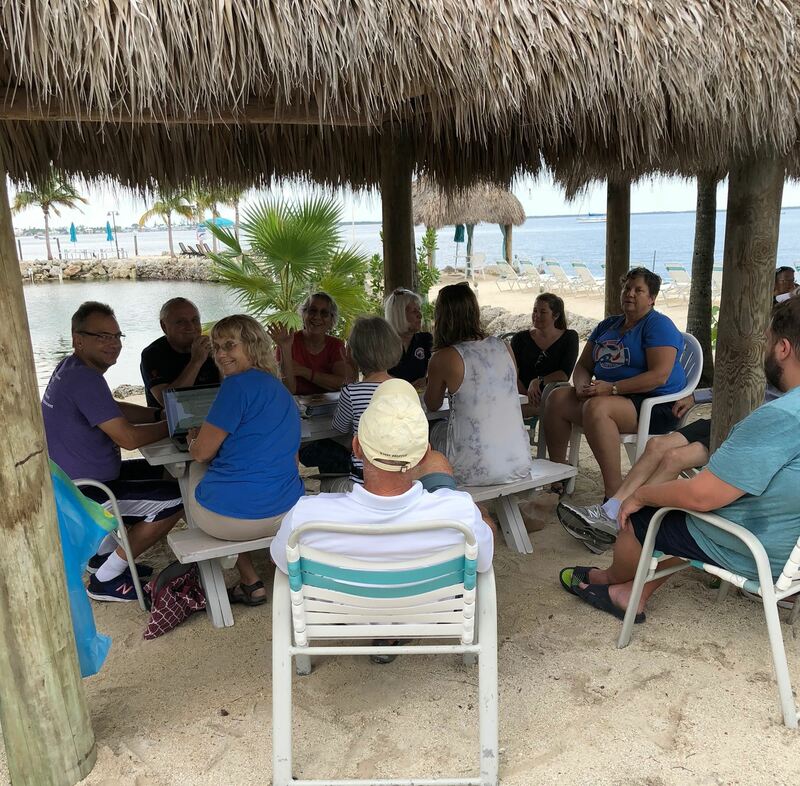 Returned Peace Corps Volunteers of South Florida, Inc., Registration # CH43538, has complied with the registration requirements of Chapter 496, Florida Statutes, the Solicitation of Contributions Act. A COPY OF THE OFFICIAL REGISTRATION AND FINANCIAL INFORMATION MAY BE OBTAINED FROM THE DIVISION OF CONSUMER SERVICES BY CALLING TOLL-FREE (800-435-7352) WITHIN THE STATE. REGISTRATION DOES NOT IMPLY ENDORSEMENT, APPROVAL, OR RECOMMENDATION BY THE STATE.